Chronic obstructive pulmonary disease (COPD) is often associated with smoking. How can it be prevented, recognized and treated? Have you heard of COPD? It is a respiratory disease that affects roughly 10% of adults over the age of 35 in Quebec. It is characterized by permanent damage to the lungs, affecting respiration. The number of cases per year increases as the population ages. The term COPD, or chronic obstructive pulmonary disease, includes chronic bronchitis and emphysema. These chronic diseases cause gradual obstruction or inflammation of the airways (respiratory tract). Those affected by it have difficulty breathing and experience flare-ups (or exacerbation), characterized by a sustained worsening of symptoms. The risks of infection, such as pneumonia, lung cancer and heart problems increase in people with COPD. 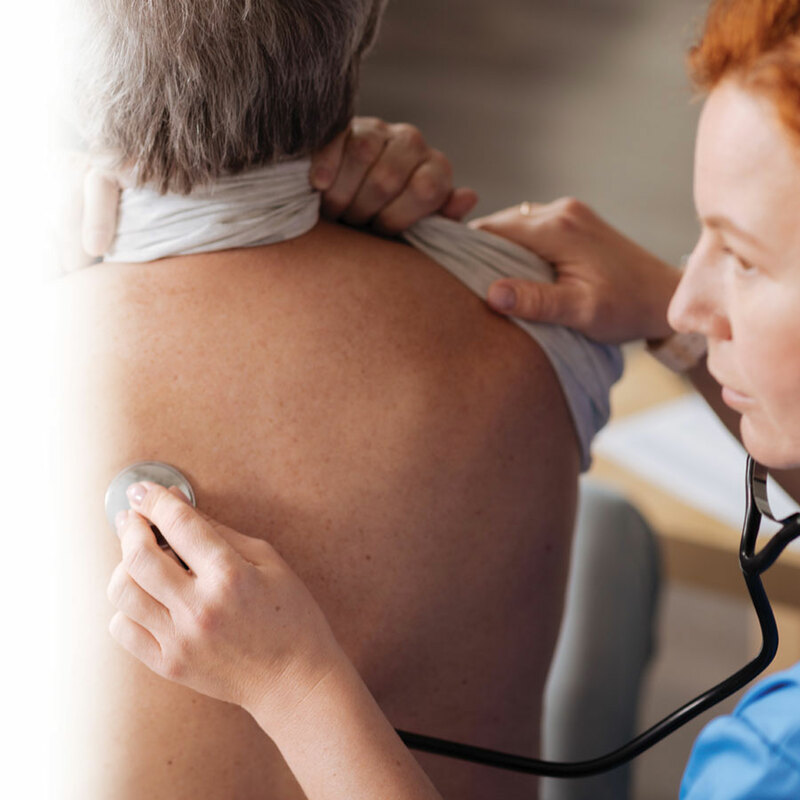 Your doctor will prescribe diagnostic tests if COPD is suspected. Early intervention helps to slow down disease progression. The primary causal factor of COPD is tobacco use. At least 80 to 90% of diagnosed cases involve smokers, and the more a person smokes during their lifetime, the higher their risk of having COPD. Since COPD is directly related to smoking, the best way to care for your respiratory health is the quit smoking permanently. Smoking cessation does not allow you to recover healthy lungs, but it does slow down disease progression. It is the only intervention known to slow the decline of pulmonary function caused by COPD. Regardless of how much or for how long you have smoked, you will notice a significant positive impact on your health if you quit smoking. Of course, smoking cessation is a major challenge, but the benefits will certainly bring you a great deal of gratification and pride: easier breathing, renewed vitality and greater exercise capability, to name but a few! Your pharmacist can help you to quit smoking, and will gladly tell you about the options and services available to you to facilitate the process. It is strongly recommended that individuals with COPD get vaccinated against the flu each year. The flu shot reduces the risk of flare-ups and prevents complications from the flu. There is also a vaccine available that protects against certain types of pneumonia and helps to reduce the risk of flare-ups. There are several treatments available for COPD, but it cannot be cured. The treatments available are primarily to prevent flare-ups, reduce symptoms and improve quality of life for those affected by it. There are several classes of medications to treat COPD. Several of them are administered by inhalation. This is the case for bronchodilators, which help to make breathing easier by opening up the airways and making it easier for air to get in. Inhaled corticosteroids (cortisone derivatives) are also often part of the treatment plan. Oral medications, such as anti-inflammatory agents, antibiotics and cortisone, may also be prescribed, and are beneficial during flare-ups. Flare-ups are often manifested as bronchial infections. Individuals who have frequent flare-ups present an increased risk of hospitalization and death. To ensure optimal care for people with COPD, preventing flare-ups or recognizing and treating them promptly is key. It is essential to closely follow the recommendations of your doctor, pharmacist or nurse when it comes to medication. Speak to your doctor to develop an action plan that will help you to recognize flare-ups and to take swift action. Additional medication, a visit to the emergency room or hospitalization may be necessary to manage an attack. When COPD becomes severe, oxygen breathed in ambient air may become insufficient, and supplemental oxygen (oxygen therapy) becomes necessary. Pulmonary rehabilitation programs teach people with COPD how to breathe easier. You will learn breathing techniques that will help you get the most out of each breath. Ask your doctor for information on the programs available in your area. As a last resort, certain types of surgery are sometimes considered. Don't hesitate to speak to your pharmacist for additional information about COPD and its treatments.